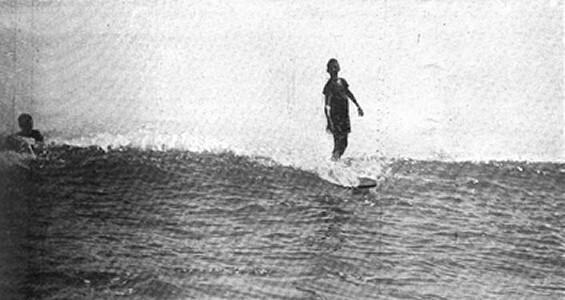 Alexander Hume Ford : Riding the Surf in Hawaii, 1909. Alexander Hume Ford : Riding the Surf in Hawaii. Volume 43 Number 21, page 17. HERE are long rolling billows on both of our coasts where surfboard riding may be indulged in. run best and longest and where the enthusiast may indulge both summer and winter. At Waikiki the great waves begin to form a mile out at sea beyond the outer reef. It is just before they break for their long foaming run that the expert seeks to catch the billow. If successful he gently slides down the foaming hill of water until near its base, and here he keeps the bit of board, to be carried at express speed toward the beach. The wave dies, but always another forms, and the trick is to carry the board over from one to another: this requires much practise, but there are those who, when there is a half storm brewing, catch the ﬁrst wave far out, pass over to the next, and sometimes guide the board safely before the third or inner line of breakers to land high and dry upon the beach. The surfboard of the old Hawaiian was usually of native mahogany, twelve feet long perhaps, for often two stood upon the one board. The surfboard of to-day seldom exceeds eight feet in length and is more often nearer six. On the smallest of these boards - i.e., one six feet long and eighteen inches wide - the heaviest man may stand, if he knows how, while the force of the wave is behind him; but in quiet waters a child may sink it. 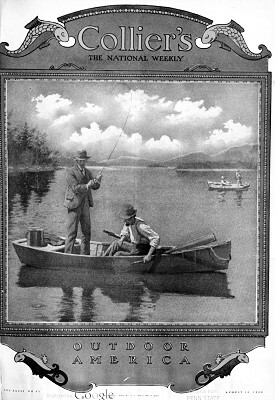 Before the big waves can be caught - the water where they form is twelve feet deep - it is necessary to develop muscles in the arms and shoulders that will propel the board at a speed, for a second at least, equal to that of the forward motion at the base of the advancing billow: if this is accomplished, the board is lifted up and carried forward at a. blinding speed, and it then becomes a matter of strength in holding on and skill in balancing the frail plank, for even the most expert may slip. If the rider is conﬁdent enough, he may start his own board by standing beside it and giving it a forward shove, at the right moment, just as the wave is upon him. Many, many times probably he will roll over, but at last the knack of balancing comes to him, and he is ready to try to stand upon his board while it is in full forward motion, not such a difficult feat after all, in the small surf where the waves are not more than two or three feet high at most. His real trials commence when he deserts the shallows and strikes out for the deep. waters they will sink with the weight of a child. IT TAKES muscle and endurance, lying upon a bit of planking with only an inch or two of the bow above water, to paddle a mile out to where the waves form. There is half a minute of violent, then several seconds of supreme, effort, the board begins to rise upon the wall of water, and then comes the fight to keep it from ﬂoating above the crest and sinking back in the rear of a lost wave. Even on the summit of the billow all is not lost; a few powerful strokes you give with your face flat on the board, then as you feel your feet slightly tilt upward, down come the arms in a twinkling until the hands grasp the board amidship in a grip of iron, the feet are drawn up to the center of the board with a quick convulsive motion and you leap to your feet, erect and balanced- if you fail, the board flies from under you and is tossed in air. turn given to the whole body, so that the board swerves and descends the hill of green on the bias. To-day Judges of the Supreme Court in Hawaii, with their wives and daughters. ex-Governors and their families, and the greater portion of the prominent business men are surfboard enthusiasts, while the schoolboys and girls of Honolulu, now that they have spacious grounds near the beach for their separate bath-houses. 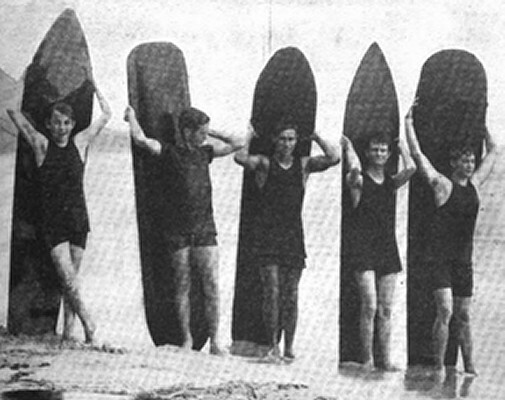 canoe-sheds, and surfboard racks, spend much time in the water, and at the recent surﬁng carnivals in honor of the visits of the American battleship and later of the cruiser ﬂeets, practically every prize offered for those most expert in Hawaiian water sports were won by white boys and girls, who have only recently mastered the art that was for so long believed to be possible of acquirement only by the native-born, dark-skinned Hawaiian. At the Christmas contest, for the third time a white boy now fourteen years of age won the medal given to the most expert surfboarder; he came in a hundred yards before a monster roller standing on his head. The white man and boy are doing much in Hawaii to develop the art of surf-riding. Nowadays the small white boy anchors an inﬂated bladder where the waves roll by at their best, invites his companions to take out sharpened reed spears and contest with him in puncturing the target, the rule of the game being that the spear must be thrown while the spearsman is actually standing on his board. their white-suited bodies being seen as they stand on the waves in a circle of light. This was one of the features of a recent night-water carnival at Waikiki. And again a white American boy came in standing on his hands in the glow of a red signal light attached to his board. The most critical instant of all comes when catching the wave on its crest and working the board down the slope- the feet must tilt the plank obliquely so that it will skim on the surface and not drop with a thud into the bottom of the hollow, which would send the swimmer and his vehicle ﬂying apart. Geoff Cater (2016) : A.H. Ford : Riding the Surf in Hawaii, 1909.